The jit.str.regexp object performs regular expression analysis to Jitter matrices, with optional substitution. To specify a regular expression, the re attribute is used. Substitutions may be specified with the substitute attribute. A full discussion of regular expressions is beyond the scope of this document, but you can read all about them here and here . jit.str.regexp gets its regular expression know-how from the PCRE library package, which is open source software, written by Philip Hazel, and copyright by the University of Cambridge, England. A word on Jitter strings: In Jitter, any 1 plane char matrix may be manipulated as a string. String matrices may have one or two dimensions. If 1-dimensional, the string is considered terminated at the first 0 (like in C). If 2-dimensional, the string may be considered a multi-line string, with the first 0 encountered on each row treated as a carriage return. The jit.textfile and jit.str.op objects will accept and output 2D matrices. jit.str.fromsymbol only outputs 1D matrices and jit.str.tosymbol only accepts 1D matrices (or the first row of a 2D matrix). 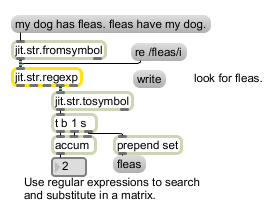 re symbol The PERL-compatible regular expression to be used by jit.str.regexp for analysis of the incoming matrix. substitute symbol A substitution string.